This article documents a small experiment with a quite small untuned loop, and LNA and receiver on 80m to assess its ability to copy signals on the band as well as the station transceiver on large antenna. 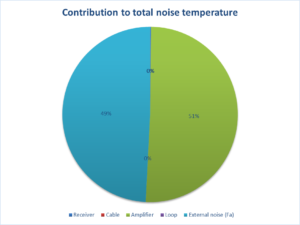 A significant factor at 80m is that ambient noise is quite high. Let’s consult ITU P.372-12 for guidance. 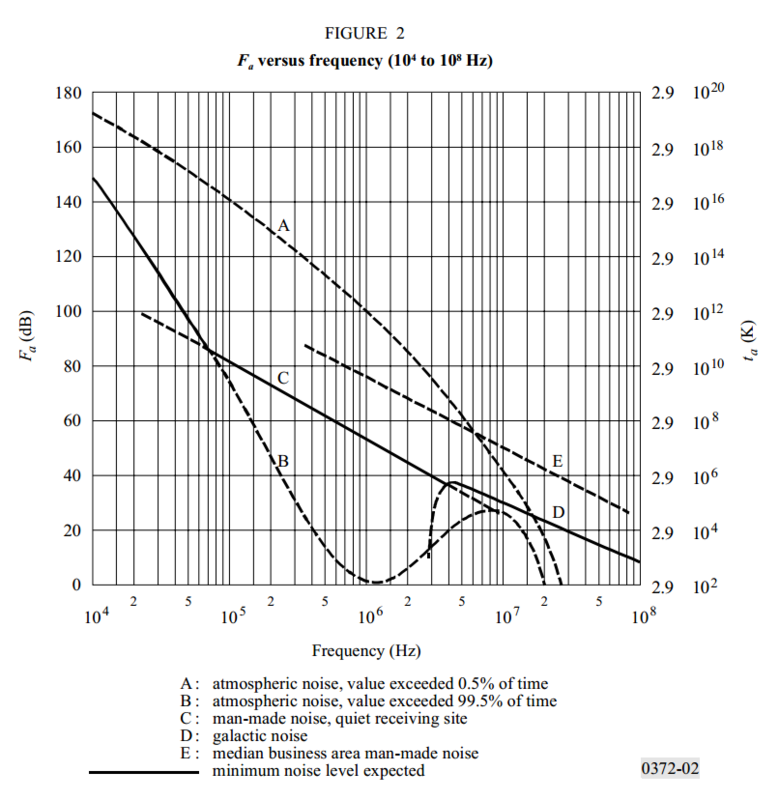 Curve E is the median city noise, at 3.6MHz Fa is about 62dB. At a more detailed level, P.372-12 gives the median noise figure for Rural precincts at 51.8dB and that figure is more appropriate to the test location (large block rural residential). The test was carried in a few spots, at 50-100 m from the main station dipole. The antenna is a small untuned loop, 600mm square with a low InsertionVSWR Guanella 1:1 balun. The loop sees a load of approximately 50Ω. 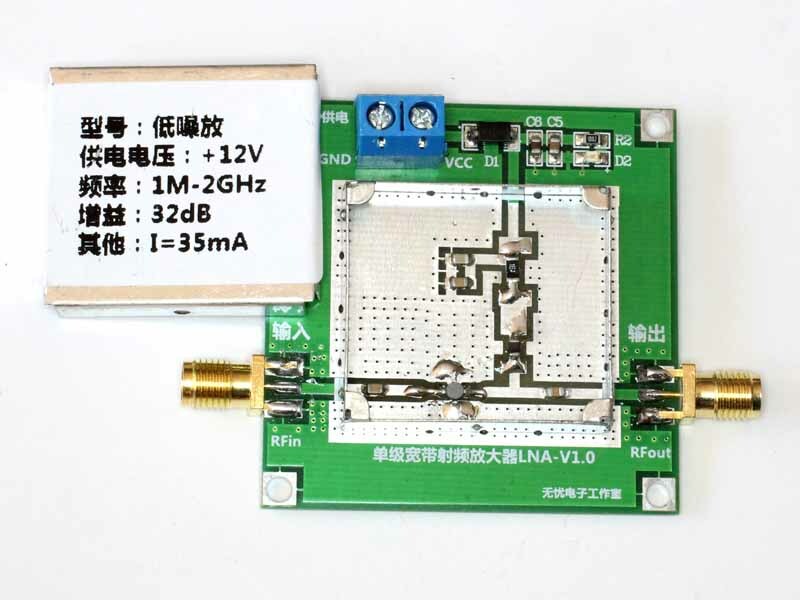 The label states the bandwidth is 1MHz-2GHz, the Chines cheat selling it headlines “0.01-2000MHz 2Ghz 32dB DC Broadband Low Noise Amplifier LNA RF Module UHF HF VHF”… but that is not unusual. The specs state NoiseFigure is 2dB at 500MHz which is believable for this type of device, gain is specified at 32dB. Taking them at face value, we can estimate system performance. So, gain is rolling off at MW and that helps to reduce strong MW broadcast signals, but the nearest is 70km distant. The preamplifier is powered by a NiCd pack strapped to it. The test receiver is a hand portable IC-R20. The receiver is self powered. It has a measured NoiseFigure of 6dB. performance prediction is shown in this spreadsheet extract. The prediction is that the S/N ratio of air is degraded 3dB by this receive system, a little more than one might like but it is not too bad. Now we must remember that this type of analysis does not include the effects of IMD noise, and there is a risk of overload of either the LNA or the receiver in this type of configuration… however, this semi rural location should be safe. 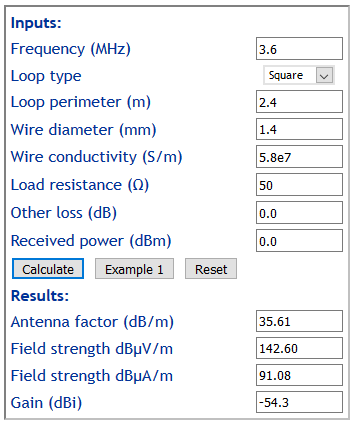 With Fa=51.8dB and lossless receiver input, the receive power captured in 2kHz Effective Noise Bandwidth is -81.16dBm. 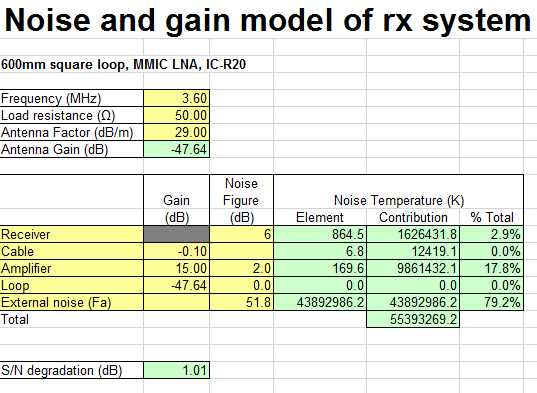 The total gain ahead of the receiver is -22.35dB, so we would expect receiver input on band noise to be around -81.16-22.25=-103.5dBm which should deliver very small S meter deflection on the IC-R20. There was no S meter deflection with LNA input terminated. With the loop connected, the S meter deflected two to three bars, a very low reading and commensurate with expectation. Importantly there was a significant contribution by off air noise. Tuning around and listening to a couple of nets, I could copy every station (VK2, VK3 and VK7, VK5 and ZL) quite well, though from reports they were not hearing each other so well. The antenna exhibited a deep and symmetric null, so its pattern was as expected. Subjective assessment was that copy was as good as on the main station transceiver and antenna. This is a quiet location, and you have heard that from people with deaf receive systems I know, but measured broadband power on the loop was some 40dB lower than recently measured in the suburbs of Canberra (Watson). Overload, non-linearity, and IMD are huge risks with broadband amplifiers. Good designs have output compression points 10dB or more higher than this LNA and it is unlikely to be a good solution “in the big city”. Nevertheless, it demonstrates that with an amplifier than can handle the broadband input well, it does provide a compact receive antenna that can be located away from household wiring and other noise sources, and with two deep nulls that may help in rejection of the worst directional noise. 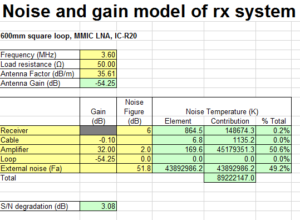 S/N degradation was a little more than desirable, but that could be solved by doubling the loop size though of course that increases the broadband signal input generally. For metropolitan / suburban deployment, a low noise, high gain LNA with high compression point would be a lower risk solution… but this $10 LNA fared very well in a quiet location. Specialised LNAs for this application appear to cost upwards of $200. 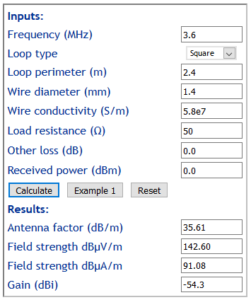 Above is a prediction for a 1200mm square loop and a LNA with reduced gain for a S/N degradation of 1dB. Huge gain does not really help, but high compression point is critically important “in the big city”. 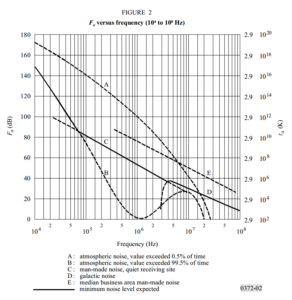 If a 15dB gain LNA had an output compression point of 20dBm, the input compression point is 5dBm, some 27dB higher than the $10 jobbie used in the tests.